Still on the first day (we’d been up for more than 30 hours by this point), we went to Versailles. 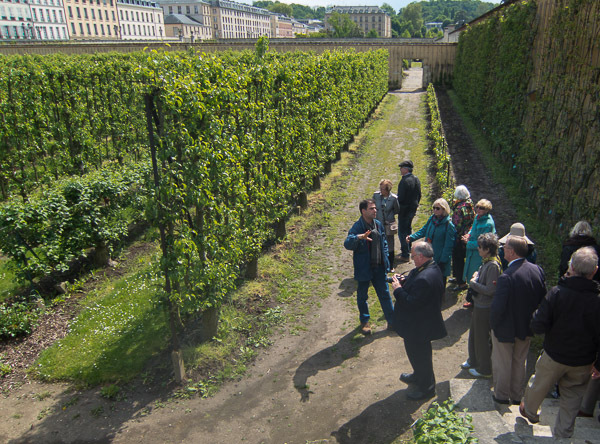 But our garden tour avoided the Palace and went, instead, to the Potager du Roi, the kitchen garden of the king. In modern times, this garden is administered completely separately from the Palace at Versailles. 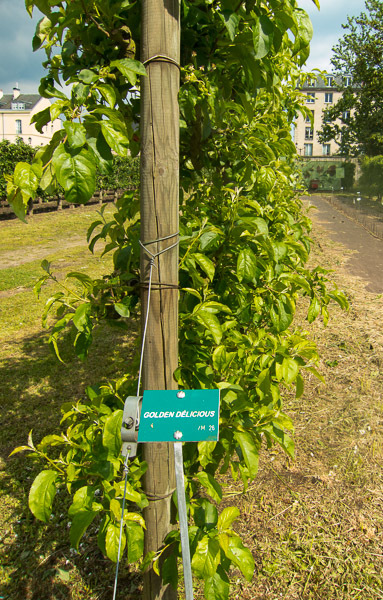 The Potager du Roi is operated by the national school for landscape architecture, École nationale supérieure du paysage. Our guide at the Potager du Roi was the director, Antoine Jacobsohn, the guy on the left in the photo talking with his hands. He was an interesting fellow, born to a French mother, a British father, and raised in the U.S. where he went to college at Cornell. His entire career, however, has been in France. While he’s perfectly fluent in English, gardening words come to him in French and he sometimes needs help with translation. The Potager du Roi is famous for its sunk gardens, which help create warmth to stretch the growing season, and for its espaliered and shaped fruit trees. Fruit trees produce most of the fruit on the surface of the tree. Shaping a tree maximizes the surface and, therefore, the amount of fruit for the space. The process stresses the trees, however, so they don’t live as long. 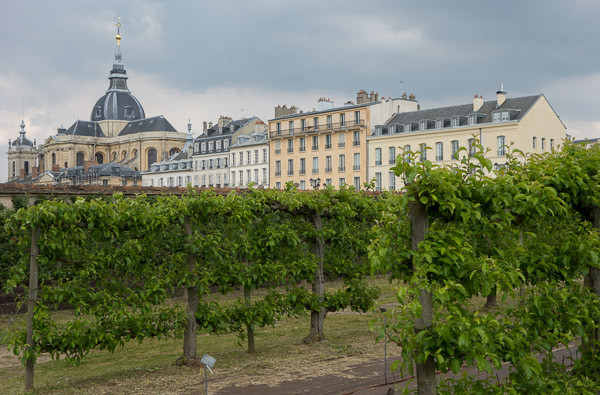 Here is a photo, that Rick took, of some of the espaliered trees with the Versailles Cathedral in the background. I thought some of my friends from my hometown of Louisiana, Missouri, home of Stark Brothers Nurseries, would appreciate seeing that Golden Delicious apple trees are given the royal treatment at Versailles. The philosophy of the Potager du Roi is not historical accuracy. King Louis the XIV didn’t eat Golden Delicious apples. Rather, the Potager du Roi is managed the way that it always has been — as a place to try new things, the latest plants and technologies for growing garden produce. There are more photos from our visit to the Potager du Roi on my Flickr page: Joy’s Photostream. Such a fascinating post Joy, I’ve visited Versailles several times, but never seen this part of the garden. I particularly like your middle picture. It’s a completely different entrance, with its own admission fee. We were driven there, but my impression is that you would have to walk a few blocks from the entrance of Versailles Palace to get to the Potager du Roi. It’s easy to find, though, since it’s across from the Cathedral. Oh thanks for that info Joy. We are going to Versailles again this trip, but don’t think that we would make it here. It sounds an interesting side trip though. The boyfriend and I have dreamed of so many things to do in France. I’ll tell him we should include this place in the list. I wish we had visited this last August when we went to Versailles!